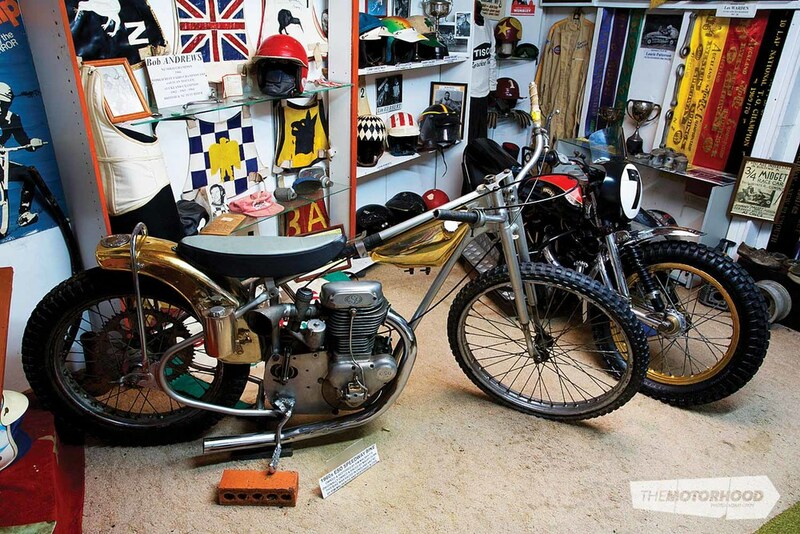 “You don’t need to be crazy, but sometimes it helps,” laughs Gordon McIsaac, the owner of what has to be one of the most — if not the most — impressive collections of speedway memorabilia anywhere in the world. As the curator of what has become known as the Speedway Hall of Fame and Museum, we don’t think Gordon is crazy, but a genius. Ever since he went to speedway with his older brother back when he was a kid, he’s been hooked, and by hooked, we mean he’s only missed eight or 10 meets at Western Springs since 1948! How’s that for dedication! The irony is, Gordon didn’t want to go to speedway that day. Instead, he’d asked his brother to take him to see his favourite cowboy movie. So it seems that being there was his destiny. It was at that first trip to the venue that Gordon started collecting the gas goggles (today’s equivalent of tear-offs), which he had the drivers sign, and ever since he’s been collecting. At first the collection filled his bedroom in the family home — which he still lives in. Nowadays it’s not just his bedroom that is overflowing with stuff, but the whole house is more museum than it is family home. From the curtains in the kitchen, which feature cars racing around a track, to the noise the doorbell makes, to every single wall inside the house, there’s memorabilia everywhere. And out of it, there isn’t a single item that’s a replica, everything is the real deal, every signature genuine, and every piece in the collection with its own story of how it came to be there. It’s not just the house that the collection has grown to take over, but what was once a small garden shed has also grown in size to accommodate everything from cars to motorbikes to clothing, to pieces of tracks — you name it, he’s got it. After convincing his parents to go to Western Springs with him, they soon got the bug, too, which developed into Gordon having midget-inspired carts to race his friends down the footpath outside home in. That very first cart remains part of the collection today. From here, he moved onto go-karts, where he was crowned Auckland Champ in ’69 and ’70, and third at the nationals for the 100cc class. Not only are the trophies from his karting years on display, but his original gloves and steering wheel as well. Despite the karting memoirs, speedway is his true love though, and he’s been recording the results of events held at the Springs since midgets first began racing there back in 1937. The very car that won the first-ever midget race is now a very prized piece of the collection. Having helped crew on the car after his father painted it many years ago, there’s a real sentimental value to the vehicle, which Gordon lovingly restored to pristine condition. The car was originally campaigned by touring American Paul Swedberg, and after being taken to Australia, it returned to New Zealand, where it was raced by Ross Reid [Jonny Reid’s grandfather] in 1947–’50, which is the period it has been restored to resemble. After being driven by many other well known drivers, and after much hustling, Gordon secured it in 1976, and restored it during 1977–’78. Since then, he’s been lucky enough to use it as a pace car at the Springs with a full field of modern Midgets behind, as well as displaying it numerous times. One highlight of the vehicle’s history was that it was doing laps around Pukekohe Park Raceway as the new millennium ticked over. “It’s an achievement no one else can claim for another 1000 years,” laughs Gordon. An artist by nature, and signwriter by trade, Gordon has a great ability with brush and paint, which he uses to create amazing paintings of race cars and bikes. These days most paintings he does are commissioned pieces, but that wasn’t always the case. One such painting of Stirling Moss’s car, which was printed in a magazine, led to Moss sending him a letter congratulating him on doing such a fine job. That letter now sits in a frame next to the painting itself. A chance meeting with American photographer Kirby Smock around 40 years ago struck up an ongoing friendship. Much like Gordon, Kirby has an impressive collection of memorabilia, the difference being that Kirby lives almost next door to Indianapolis Motor Speedway. Over the years, the pair have traded items and visited each other many times, every time returning with various treasures. It’s this friendship that has seen Gordon acquire items such as a tyre from the winning Indy 500 car in 1995, a miniature inflatable blimp with the signature of all drivers who competed at the Indy 500 in 1975, and many more. The amount of autographed items in the collection is unbelievable, and for each and every one of them, Gordon has been lucky enough to meet the signee in person. “They were my idols as kids, and now they come here to see me for a coffee and a look around,” says Gordon. And he’s right, the number of famous faces he’s seen through the house, he’s lost count of. “I’ve had Denny Hulme, Ivan Mauger, Barry Briggs: all world champs, and the list goes on,” he says. The well worn visitor book sitting on the kitchen table is a testament to that, filled with signatures from around the globe. Once word of the growing collection got out, more and more items started being donated. “I never know what I’ll come home from Western Springs with,” he laughs. The donated items don’t only coming from local tracks, however, and the prosthetic arm sitting in the shed is an example of one of the items that have been collected from further afield. The arm was once attached to Merle Bettenhausen, after he lost his real arm at a crash at Indy in 1973. Once he quit driving, he decided he was better off without it, so he posted it over to Gordon to become part of the collection. Items such as the seat, and nose cone of Jeff Gordon’s sprint car (who was just a teenager when he toured in 1988 and left the parts with Gordon) have now become invaluable pieces, and are just one small example of what else you’ll find here. The sheer magnitude of the collection is such that you’ll never see everything during one visit, no matter how long and hard you look. An incomplete vintage midget is one of the pieces Gordon is most proud of. The car was owned by Stan Owens, who gave up the build half way through, and was eventually donated to Gordon. The pile of brand-new unused tyres complete with labels still attached came with the car, which now sits in an area purpose-designed to look like an old workshop, and which oozes authenticity. 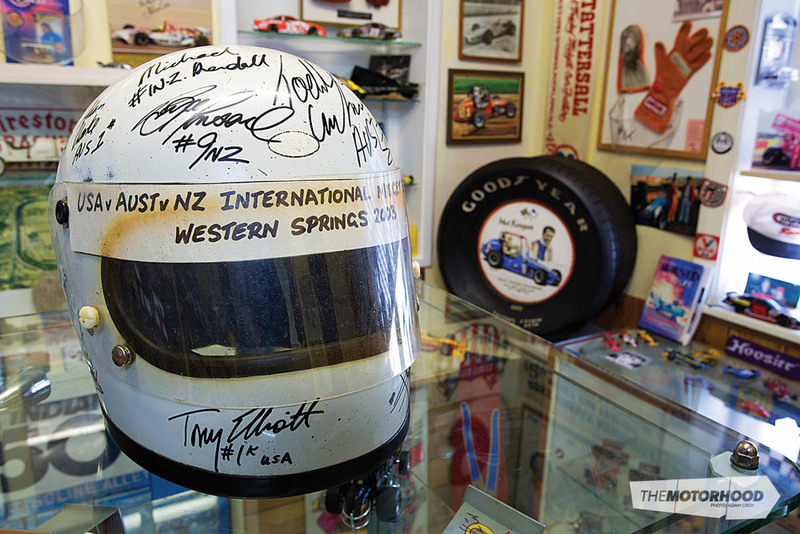 Each and every wall in the shed has items with a story to tell — be it anything from a piece of the original pit building at Western Springs to a helmet once worn in competition either here or abroad. One area of common interest is the collection of different soils from tracks around the world, “No one is quite the same as another,” remarks Gordon, and he’s right. Likewise, the soil samples from the Springs taken from different decades are also remarkably different. Elsewhere you’ll find an original 1901 brick from Indianapolis, and a piece of the timber track from long closed Cotati Speedway in California that was laid in 1922. Eventually Gordon would love to see the collection transferred into a dedicated museum where people could get to see it more often. However, as it stands the current set-up is open by appointment and donation, as Gordon says, “There’s no point in having it all hidden away, it needs to be seen and enjoyed”. If you or your car club are looking for an amazing way to spend a day, give him a call on 09 376 2880. But be prepared, what you’ve seen here doesn’t do the collection or the passion Gordon holds justice, it really is beyond words, and needs to be seen to be believed. 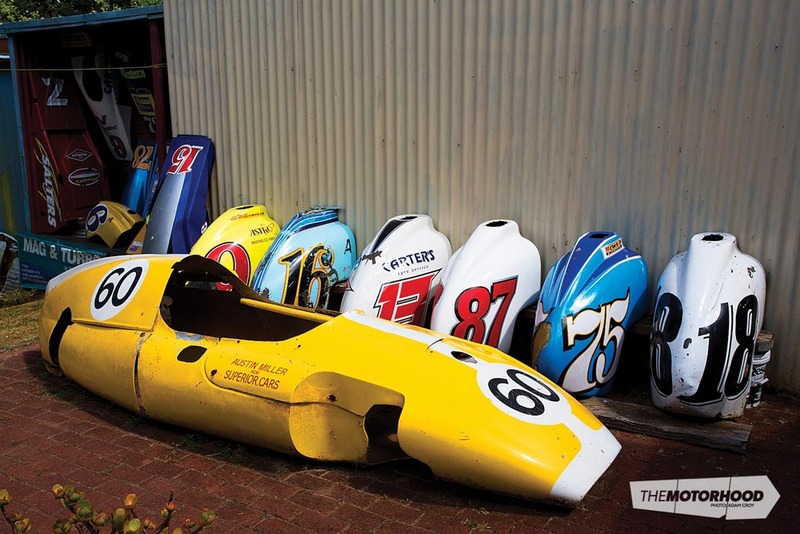 Gordon's shed was featured in NZV8 Issue No. 94 (March 2013). You can grab a copy here.